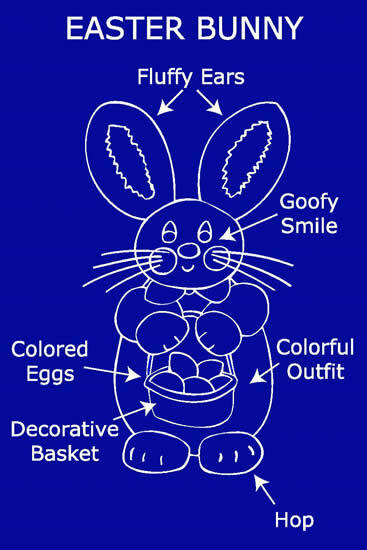 Take an exclusive peak into the inner sanctum of The First Easter Bunny - his plans, experiments, and day dreams. Click on the thumbnails below for a close up look at the Bunny's merry mayhem. It took years of toiling in his workshop before our fluffy hero emerged as The Easter Bunny. There were many early attempts at other holidays and treats while the Bunny searched for his special purpose in life. Early treat experiments included gifts of meat, cheese and crackers. The Bunny tried many different incarnations including The 4th of July Bunny, St. Patrick's Day Bunny, Halloween Bunny, Thanksgiving Bunny and even The Christmas Bunny before fulfilling his destiny as The Easter bunny. So poke around and see what you can learn. As more items are discovered they will be posted.